Emerson Fittipaldi edged out Denny Hulme to take victory for Lotus. With just three races to go in the season, it effectively secured Fittipaldi the title, unless something ridiculous happened (spoiler alert: it didn’t). Another victory for a black and gold Lotus, this time in the immensely talented hands of Ronnie Peterson. The race was halted early on after a heavy rain shower, but Peterson was in control throughout and finished 47 seconds ahead of second-placed Patrick Depailler. Vittorio Brambilla finished sixth, scoring the final point in the history of the Surtees team. Sadly, it would also turn out to be Peterson’s 10th and final victory - two races later he died as a result of injuries from a first-lap accident at Monza. Looking back, the Austrian GP could almost be viewed as a kind of passing of the torch - joining Peterson in the top-three was the equally-spectacular Gilles Villeneuve, his first F1 podium. Nigel Mansell only qualified 12th for the 1989 Hungarian GP. If things went his way, there were lots of retirements and he was really really lucky, he might have finished 10th - because back then overtaking at the Hungaroring was even more difficult than it is now. Somehow, however, Mansell made his way through the field and soon found himself behind leader Ayrton Senna. 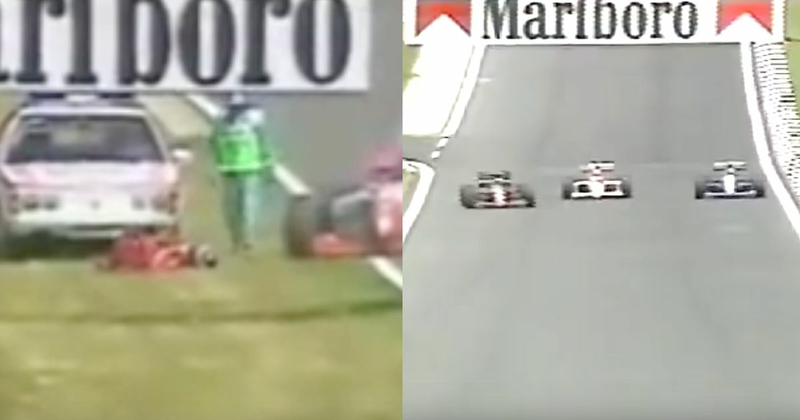 Senna himself had only been leading for a few laps after Riccardo Patrese retired from first with a broken radiator when he came up to lap Stefan Johansson’s Onyx. Mansell spotted his opportunity and snatched the lead with a brilliant pass. This is what you all want to see, isn’t it? Yes, Damon Hill led David Coulthard to a Williams one-two and yes, Rubens Barrichello was set for a podium for Jordan before breaking down on the last lap. But you don’t care about any of that. You just want to see Taki Inoue getting run over by a course car. Inoue was one of the worst F1 drivers of all-time (by his own admission) which just makes this even funnier. Whilst trying to prevent his Footwork from burning, neither he nor the driver of the emergency vehicle saw each other and Inoue rolled over the bonnet. A slightly sore leg aside, Inoue was absolutely fine, so you can enjoy this as much as you like. 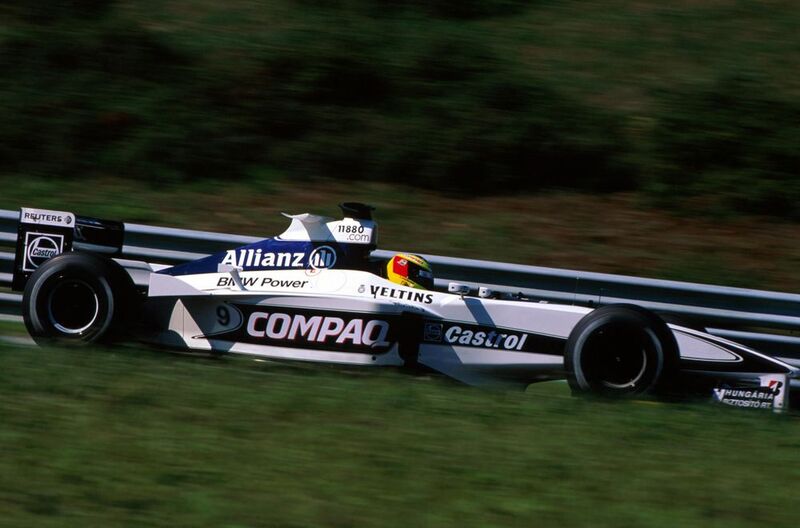 A slightly less dramatic race than 1989 or 1995, Mika Hakkinen snatched the lead from third on the grid and went on to win. Pole-sitter Michael Schumacher finished second, but it wasn’t enough to hold onto the championship lead as the Finn topped the standings for the first time all year. Divina Galica (born 1944) was an Olympic skier who ended up having a second career as a racing driver. A multiple-podium finisher in the British F1 series, she had three attempts at qualifying for a world championship race. The first came in her home grand prix at Brands Hatch in 1976, driving a Surtees, where she failed to qualify. In 1978 she landed a drive with Hesketh, but the team was way off what it had been in the glory years with James Hunt and after failing to qualify for the first two races of the year, Galica went back to racing in the British championship. Her replacements at the team fared little better, and a few races later Hesketh folded.